Specifications: - Material: high-quality and recycled paper. - Operating System: No need - Virtual screen: 3.5~6 inch - Menu Language: No need - Resolution Based on the film source - Color Bit Based on the film source - Video: Left-right 3D - Connector: No - Certification: No - Headband Girth: 20~40cm - Weight: 50g Steps to install: 1.Tear off the seal of JoyGeek Cardboard. (You will see these words) 2.Take apart the cardboard from the "Detach here". 3.Find the "Star Here",from this to start to assemble insert the numbered tags into their corresponding slots. 4.Use tape or glue to make the cardboard sturdy. 5.Affix the NFC tag on the back cover and install the headband. Note: 1.Pls search"Google Cardboard" in Google Play and Apple APP Store. 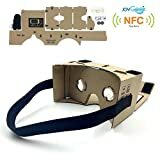 2.Whether your phone system is Android or other systems,you can use the JoyGeek Cardboard to watch Left-right 3D movies on Video Player and play varieties of VR games. 3.More than 300 virtual reality apps on Apple App Store and Google Play Store for you download to enjoy shocking 3D effect. Package included: - 1 x JoyGeek Luxury Google Cardboard-Yellow - 1 x JoyGeek Custom NFC Tag - 1 x JoyGeek Custom Headband Warranty: -JoyGeek is a registered trademark in the USPTO,and it also enrolled in Amazon Brand Registry. Feathers: -This headset comes in a protective cardboard sleeve, just slide the cardboard kit out to enjoy and slide it back in when not in use. -The Conductive foam button give you complete control of your experience, works on both iOS and Android devices. -The kit also includes Velcro strips to secure both the top and side panels of the VR Kit and a rubber band. -Simply slip your Google Cardboard-enabled phone into the assembled kit to start experiencing breathtaking VR. -Asymmetrical biconvex lenses with 37mm Diameter Lens. -A new program called Expeditions is designed to let teachers bring their classrooms on "virtual field trips" to various locations around the world via the wonders of stereoscopic 3D. Specifications: -Material: Cardboard +Lens+Magnet+Velcro -Folding Size: 14.5cm x 6cm x 8.5cm -Type: Unassembled DIY Cardboard Kit, 1~2 minutes assembly. Note: -Google Cardboard V2 was designed to hold up to 6 inch phones.If you use it with a case it might be too big to close up. 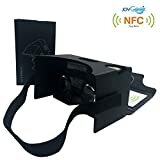 Package Include: -1 xJoyGeek Google Cardboard V2.0 VR Cardboard Kit With 37mm Diameter Lens (Black) -1 xJoyGeek Customer Head-strap -1 xJoyGeek Customer NFC Tag Warranty: -JoyGeek is a registered trademark in the USPTO,and it is also enrolled in the Amazon Brand Registry. Specifications: - Material: high-quality and recycled paper. - Operating System: No need - Virtual screen: 3.5~6 inch - Menu Language: No need - Resolution Based on the film source - Color Bit Based on the film source - Video: Left-right 3D - Connector: No - Certification: No - Headband Girth: 20~40cm - Weight: 50g Note: 1.Pls search "Google Cardboard"in Google Play and Apple APP store. 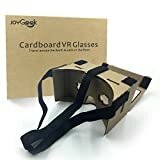 2.Whether your phone system is Android or other systems,you can use the JoyGeek Cardboard to watch Left-right 3D movies on Video Player and play varieties of VR games. 3.More than 300 virtual reality apps on Apple App Store and Google Play Store for you download to enjoy shocking 3D effect. Package included: - 1 x JoyGeek DIY Google Cardboard - 1 x JoyGeek Custom NFC Tag - 1 x JoyGeek Custom Headband Warranty: -JoyGeek is a registered trademark in the USPTO,and it also enrolled in Amazon Brand Registry. -We uploaded QR code for Cardboard APP to Google Drive, you can download it via the link: http://bit.ly/29pBDqg -The QR code in the manual will lead you to a testing video but not for Cardboard APP. You can scan it in a WIFI environment to open a Youtube side-by-side testing video.Features: 1.Just play without adjusting the focal length, everyone can use it no need adjust,more easy and better than adjustable one. 2.The only one in the world to use Fresnel lens, compared with other common convex lens, our lens do the least harm to your eyes in the current market. 3.The inflexible but adjustable strap better let the VR glasses excellently decentralizes the gravity, making you feel more comfortable. 4.Through various experiments, the sponge on the glasses is the most comfortable with great air permeability. It can effectively protect you from the skin irritations while wearing the glasses. 5.The gaps on lateral sides make the heat dissipation of your phone, earphone connection and charging while using available. 6.According to the human body engineering design, nose space designed can effectively reduce the extrusion on the nose. You can enjoy your movie best with any postures. 7.As for the duration for use: better to not more than 2 hours each time. Specifications: - Material: ABS spherical resin lens. 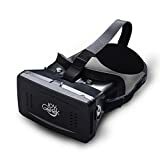 - Virtual screen: 3.5~6 inch - FOV: 68 degrees - Resolution Based on the film source - Color Bit Based on the film source - Weight: 200g Package included: - 1 x JoyGeek RIEM-II 3D Glasses - 1 x JoyGeek Customer Headband - 1 x Magnet - 1 x User Manual Warranty: -JoyGeek is a registered trademark in the USPTO,and it is also enrolled in Amazon Brand Registry.